The AABSL board and members donate all of their time and services. Officers are always available to offer advice and aid by phone for troublesome situations. AABSL continually seeks active members to help the organization and strengthen its efforts. America Against BSL is soon to be a non-profit organization and exists solely on donations, and dedicated to the preservation of all endangered breeds. But being a member does not just mean writing emails, or posting to message boards. It means becoming part of the solution. Public action and education is the only road that we need to walk. That is why we need you! Even if you think that you are not affected by BSL, think again. It is spreading fast and together we can make the difference. We are not solely focused on a Pit Bull's rights. We are focused on protecting all breeds that are victimized by BSL. It is not fair that any of us should be offended for owning such a breed. However, we as Pit Bull owners have tough skins, we accept that certain people think and say offensive things to us. We can take that. What we will not lay down to the idea that this breed is naturally dangerous and needs to be destroyed. We post new articles to read that we find across the web. Also links to Petitions to sign. We also collect Educational Resources for both Adults and Children. We team others up with people in their local community to act on issues that are happening in their own community. We also help with issues that arise across the Nation. Being a member to AABSL is satisfying because the other members are here for you. In the past year, we have grown to a little over 150 members, including the Vice President of ADBA. And there is nothing quite like the feeling of knowing you've helped to make our nation a better place! Below is a list of how many members we have in each state. We are waiting to hear from the rest of the members to add them on. If you don't see your state, or want to make sure you are counted below, contact us! 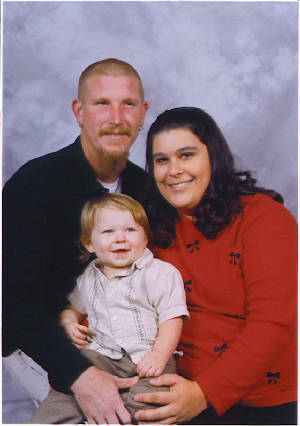 This is Allison, her husband, Eric and son, Jesse. Allison Wood is the founder of AABSL. She is very dedicated to her work, and spends every minute of spare time on this organization. Her husband and family all support her and help in any way they can. Although she has no professional training, she has grown up with dogs her whole life and she currently owns American Pit Bull Terriers. That is the main reason she got involved with fighting BSL. In the beginning, she would stand in front of PetSmart and hand out informational flyers to residents regarding Pit Bulls, BSL and responsible dog ownership. Now, she has created this website to reach more people. Every month, she still goes to PetSmart and now she talks to all the kids that are there with their parents.